Eden Hill Primary School Year 2 teacher Bec Dwyer with students, from left, Dylan Dalgleish, Tenika Baenisch, Koskei Partington-Hopes and Venus Kairiza. Teacher Bec Dwyer said each year the school prefects organised a fundraising event that encouraged compassion for others in the community. ‘This year they were told about Rett syndrome by one of the teachers whose niece suffers from this rare disorder,’ Ms Dwyer said. 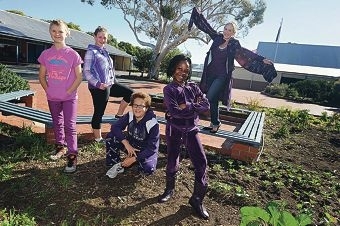 Ms Dwyer said students were encouraged to wear the colour purple currently used to promote research being conducted. ‘It was the last Friday of term and everyone enjoyed the chance to come to school in free dress, especially the Dockers fans, and to show their support for this very worthwhile research,’ she said. Rett syndrome is a severe genetic disorder of the nervous system. It is usually only seen in girls and affects all body movement, including loss of speech and hand use.